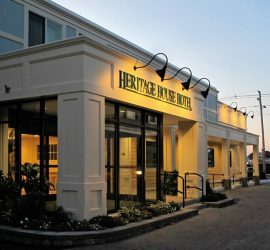 If you are looking for a full service, AAA rated hotel, whose passion is to provide outstanding service partnered with an inspired facility in the best location on Cape Cod, then The Heritage House Hotel is perfect for you. 143 newly renovated, affordable rooms, offering executive king, king, queen, double beds and a few family suites. 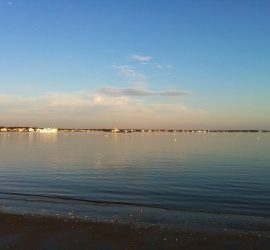 The first solar powered hotel on Cape Cod: as we produce energy, we conserve energy! Being green is easy when you stay with us. Serving breakfast 7 days a week. 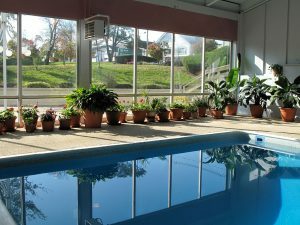 Indoor salt-system pool, an outdoor pool (seasonal), patio, and newly renovated hot tub. Flat screen color TV’s, free hi-speed Wi-Fi, refrigerators, hair dryers, coffee makers, irons and ironing boards, and personal amenities. Steps from transportation center, the Boston Cape Flyer train and the Cape Cod Scenic Railroad. At the east end of Hyannis’ historic Main Street galleries, eateries, local shops, entertainment, the Duckmobile, and the nationally famous JFK Museum. 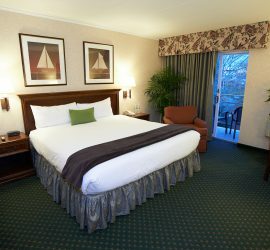 One block from Hyannis Inner Harbor: sailing, sightseeing and fishing boats, island ferries, Cape Cod Maritime Museum, & restaurants. Stay and Play Cape Cod: Customized golf packages.